Your pet's annual examination is key to preventing disease and keeping your pet healthy. If an abnormality is identified during your pet's exam, the veterinarian will be able to suggest further testing or treatment to help your pet live a long, comfortable life. Exams performed every year help your veterinarian establish a baseline knowledge of your pet's health, and allow detection of diseases before they become more serious and difficult to treat. The annual visit is also a great opportunity for you to ask questions and learn more about your pet. We will also give you tips to keeping your pet healthy including dental care, parasite prevention, and management of any disease your pet may have. ​During the exam, our veterinarians will perform a thorough check of your pet. This includes examination of all parts of your pet, nose to tail! We will examine ears, eyes, nose, and throat for signs of blindness, loss of hearing, ear infections, and more. We will listen to heart and lungs, palpate the abdomen, and check muscles and joints for signs of swelling or pain. Routine blood tests are also performed including heartworm disease test and Lyme Disease test. A CBC and/or Serum Chemistry can also be performed to screen for signs of diabetes, kidney disease, liver disease, and more. Vaccinations are commonly administered at your pet's annual exam appointment. Many deadly diseases can be prevented using safe, effective vaccinations. Your pet's vaccines will be tailored to their individual needs, and will be discussed with you at the vaccine appointment. Professional dental cleaning is needed when periodontal disease is present. Your pet's teeth are examined at each annual visit, and may need to be examined if you notice a problem or concern with your pet's mouth. The veterinarian will indicate if a dental cleaning is necessary. Every professional dental cleaning starts with a review of the patient's general health and any previous dental history. For a thorough, safe dental cleaning in veterinary patients, anesthesia is essential, as this permits a comprehensive assessment of the tissues, allows dental radiographs to be made when indicated, followed by the cleaning (scaling and polishing procedure) itself above and below the gum-line. Bad breath. Loose teeth or teeth that are discolored or covered in tartar. Your pet shies away from you when you touch the mouth area.Drooling or dropping food from the mouth. Bleeding from the mouth. Loss of appetite or loss of weight (this combination can result from diseases of many organs, and early veterinary examination is important). Your pet will go home the same day of the dental procedure with instructions for home-care and at-home preventative maintenance. Our veterinarians are trained to perform numerous soft tissue surgical procedures. 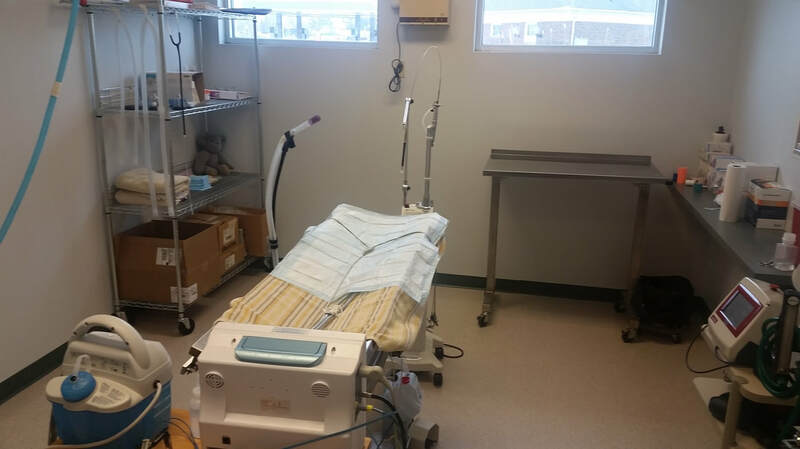 A range of soft tissue surgeries can be performed in our clinic including spay, neuter, declaw, hematoma repair, tumor removal, skin growth removal, and biopsies. We also perform more advanced surgeries including eye enucleation, entropion repair, cherry eye pocket surgery, and cystotomy. Our surgical technique includes use of a surgical CO2 laser which replaces the need for a scalpel blade during surgery. The laser generates and intense beam of light that cuts and seals tissue. This means less blood lost during surgery, less pain and swelling after surgery, and overall improved recovery for your pet. Your pet's safety before, during, and after anesthesia is a top priority for our veterinarians. Anesthesia is administered using endotracheal intubation, and is monitored closely while your pet undergoes the surgical procedure. An anesthesia plan is established using your pet's history, physical exam findings, medical tests, and knowledge of the planned procedure. Monitoring is key to successful anesthesia. Your pet will be monitored during the procedure using electrocardiography (EKG), heart rate, heart rhythm, pulse strength, blood pressure, and more. Your pet will also be monitored during the recovery period as it wakes up from anesthesia to ensure patient comfort, reduce fear, and prevent injury. 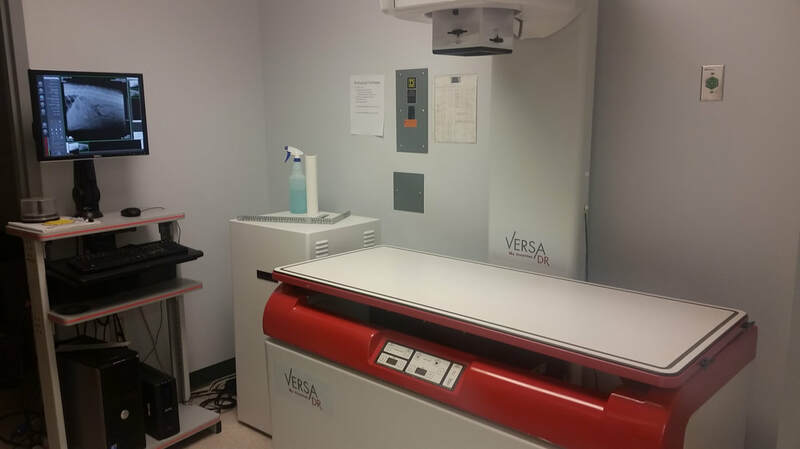 Radiographs, commonly known as x-rays, assist our veterinarians with diagnosing abnormalities in the skeletal, cardiovascular, pulmonary, gastrointestinal, reproductive, and urinary systems. Digital radiology allows us to take and interpret images more rapidly and accurately. This technology also allows us to easily share the radiographs with you right away. Laser therapy is a surgery-free, drug free, noninvasive treatment to reduce pain, reduce inflammation and speed the healing process. Laser therapy accelerates the body's natural healing process through photo-bio-modulation. Treatment protocols are unique to each patient and condition. It can be used to enhance other treatment plans recommended by your veterinarian. Laser therapy is effective in treating chronic conditions, acute conditions, and post-surgical pain and inflammation. Laser therapy has been scientifically proven to be successful for the treatment of many painful conditions. Examples include: wounds, allergies, infections, arthritis, hip dysplasia, skin infections, back pain. 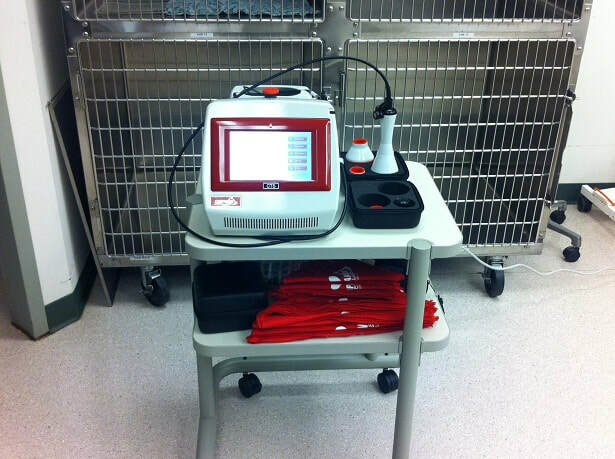 Contact us today to determine if Laser Therapy is right for your pet. We offer in-house blood-work with our Idexx software! With our in-house equipment, we are able to give clients results within 20 minutes, leading to a quicker diagnosis and faster treatment time. Ask us about our wellness screenings with your next annual exam!